Gravity Biking as leaves start changing! Minnesota is famous for its frigid winters, however, the Lodge at Giants Ridge is also proud to introduce gravity biking with thrilling trails and beautiful landscapes! So book your stay in our gorgeous Virginia MN lodging cabin as the fall foliage begins to change! You may not be familiar with this up-in-coming bike, so we’d like to introduce the gravity bicycle! It’s a low-riding bike that’s meant to be ridden downhill at incredible speeds. It’s an almost soothing concept if you enjoy thrills as you rush downhill with just the sound of the wind and the road! Although your speed varies according on the hill you ride, you’ll average a 50 mph, occasionally reaching 80 mph. While those speeds may have you questioning gravity biking’s legality, we’re here to reassure you that they are legal on all public roads where bicycles are allowed. So, if you’re looking for a high-adrenaline activity during your stay at our Virginia MN lodging, gravity-bike rides on either one or both, of our trails are exactly the activity for you! We feature two different gravity-biking trails here at Giants Ridge, LeapFrog and Sector 12, that will enhance your ride by making it enjoyable and fun! LeapFrog is a winding intermediate trail, that’ll gently introduce you to gravity riding for beginners. Riders will encounter rollers, rock features, berms, and jump prospects. All of which lead-up to jumps, hence the name: “LeapFrog.” You can also practice on surrounding intermediate/advanced B-lines. You’ll wander through the majestic Superior National Forest and Giants Ridge’s rugged beauty through the LeapFrog trail. Sector 12 offers some of the best gravity riding experience in Minnesota, with thrills for even the most-experienced gravity mountain bikers! 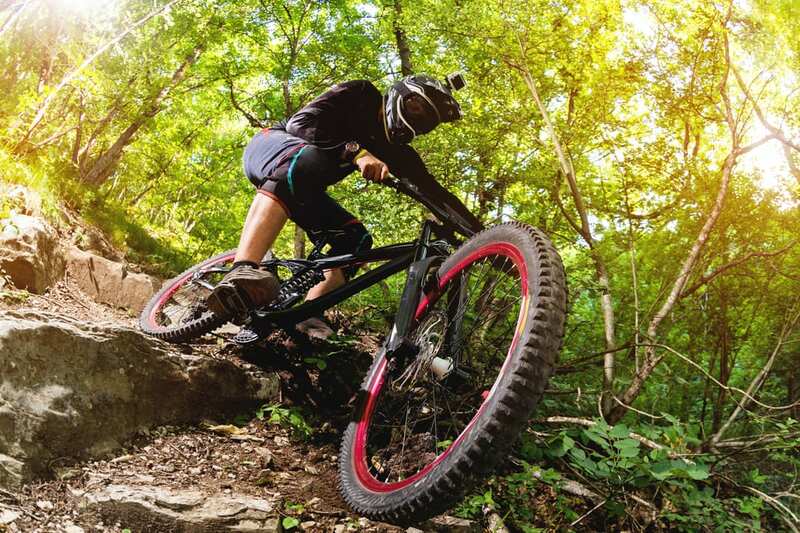 This trail offers authentic bike park elements and styles, such as massive berms, big jumps, flowy rollers, quick successions of rock drops and rocky boulder gardens. Although Sector 12 is designed to help you fly, your tires don’t need to leave the ground unless you choose to do so. Experience high speed through extremely difficult optional B-lines, which also include rock drops and a gap jump. Sector 12 showcases the plentiful giant granite boulders surrounding our Virginia MN lodging accommodations! If you’re a fall outdoor aficionado, plan a weekend at The Lodge at Giants Ridge within the next couple of weeks as breathtaking fall colors transform Minnesota’s forests and plains into a picturesque canvas! Longer end-of-summer days and shorter bouts with sunshine, as well as cooler nights, trigger the change. The most radiantly colored leaves show their hues after several warm and sunny days and cool nights, leading up to mid-September or early October peak season. As days pass-by you’ll find that within both September and October offer ever-changing landscapes that’ll draw you to our exclusive Virginia MN lodging for a memorable outdoors trip! Join us for a thrilling gravity-bike ride through the season change while staying in a prime Virginia MN lodging, the Lodge at Giants Ridge!